The tuberous sclerosis complex (TSC) patients with refractory epilepsy involving eloquent are poor candidates for conventional resection surgery. We have previously proved that the approach of bipolar electro-coagulation on functional cortex (BCFC), which is similar to multiple subpial transections (MST) in the treatment of unifocal epilepsy involving eloquent areas, is effective, safe and easy to operate. This report describes our some long-term followup for combined foci resection and BCFC in TSC patients with refractory epilepsy involving eloquent cortex. Ten patients aged from 10 to 35 years were admitted with refractory epilepsy. Cranial computed tomography (CT) and magnetic resonance imaging (MRI) showed classic features of TSC, and met the diagnostic criteria of TSC. The ten patients, who underwent combination therapy of foci resection and BCFC for epilepsy management between May 2004 and May 2014, were retrospectively reviewed with regard to seizure outcome, MRI, neuropsychology and postoperative complications. The outcome of Engel class I was achieved in 5 patients, Engel class II in 3 patients and Engel class III in 2 patients, respectively. The results of MRI of the 10 patients showed no significant changes in the morphology of the coagulated area, and the 8 of them were effectively improved on postoperative intelligence and memory scores by WISC - RC scale and WMS scale evaluation. One patient developed mild hemiparesis after electro-coagulation and was fully recovered within 1 month. No permanent neurological deficit was found for all the patients during a standard clinical examination. The combination therapy of foci resection and BCFC is an effective and safe surgical approach for the treatment of TSC associated epilepsy involving eloquent cortex. Tuberous sclerosis complex (TSC) is an autosomal dominant genetic disorder, which caused by inactivation of the tumour suppressor genes hamartin (TSC1) or tuberin (TSC2), and affects approximately 1 in 6000 individuals per annum. About 85% of TSC patients manifesting with seizures that are often refractory to antiepileptic treatment . Epilepsy surgery in patients with apparently focal epilepsy may be a good option. However, some TSC patients are with refractory epilepsy involving eloquent areas, which made these patients poor candidates by routine operation. Combined multiple subpial transections (MST) and resection has been demonstrated to improve seizure control in patients with multifocal epilepsy involving eloquent cortex , including one patient with TSC-associated epilepsy , without inducing significant functional deficits. We have previously developed and applied a new method in the treatment of epilepsy specifically located in eloquent areas, which was called bipolar electro-coagulation on functional cortex (BCFC) [4-7]. Our results demonstrated that in some cases, when the epileptogenic foci were located in a functional cortex, the combined therapy of non-eloquent foci resection and BCFC was proved effective and greatly improved the outcome of the surgery [4,5]. In the utmost recent study we demonstrated that the BCFC technique was really effective and safe, without resulting in permanent neurological deficits in the treatment of unifocal epilepsy involving eloquent areas [6,7]. The combined foci resection and BCFC in the treatment of TSC patients with refractory epilepsy involving eloquent has not been reported so far. Here, we retrospectively reviewed all data of the 10 patients who were diagnosed with TSC and underwent the combined foci resection and BCFC at the Beijing Sanbo Brain Hospital and Beijing Sanbo Fuxing Brain Hospital between May 2004 and May 2014. Ten patients who were diagnosed as TSC with epilepsy involving eloquent and noneloquent cortex were included in this study, who underwent resection with BCFC at Beijing Sanbo Brain Hospital and Beijng Sanbo Fuxing Brain Hospital from May 2004 to May 2014 and followed up for 30 to 72 (mean 49.5) months. There were five males and five females, aged 10- 35 years, with a mean age of 18.1 years. They had 14.9 years of recorded preoperative history of epilepsy on average. Seizure types included complex partial seizures (CPS), simple partial seizures (SPS), generalized tonic-clonic seizure (GTCS) and secondary generalized tonic-clonic seizure (SGTCS). All the Ten patients underwent CT, MRI and video scalp electroencephalography (EEG) monitoring as pre-surgical evaluation. Additionally, Eight and seven patients received magnetoencephalography (MEG) and intracranial EEG (invasive monitoring), respectively. 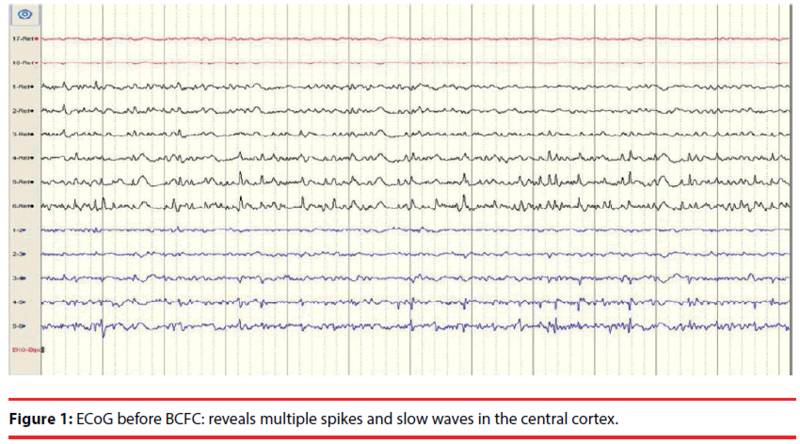 Figure 1: ECoG before BCFC: reveals multiple spikes and slow waves in the central cortex. Figure 2: ECoG after BCFC: reveals discharge disappear. Red and white stripes at regular intervals were clearly visible on the electro-coagulated cortex. The BCFC was applied over outside arachnoid mater and the blood vessels located in pial mater remained undamaged except for the capillaries, After BCFC, the artificial dura was covered on the cortex, which can significantly reduce the occurrence of adhesions and epilepsy. 1. The mean duration of postoperative follow-up was 49.5 months (ranged 30- 72 months). The outcome of Engel class I was achieved in 5 patients, Engel class II in 3 patients and Engel class III in 2 patients, respectively. 2. Follow-up MRI was performed on the ten patients 1 to 3 years after surgery, showing no abnormality in all the patients (Figure 3). Figure 3: Epileptogenci regions located in the eloquent and non-eloquent areas. 3. Neuropsychological evaluation was performed just before surgery, 6 months after surgery and 2 years after surgery and the postoperative intelligence and memory scores were effectively improved according to Wechsler Adult Intelligence Scale-Revised in China or Wechsler intelligence scale for children-Revised in China (WAIS-RC or WISC-RC) and Wechsler Memory Scale-Revised in China (WMS-RC) evaluation (Table 1). Table 1: Neuropsychological evaluation of the ten patients with TSC before and after epilepsy surgery. 4. Complications: One patient developed mild hemiparesis after BCFC and was fully recovered within 1 month. No occurrences of hemiparesis, hemorrhage or infection. No permanent neurological deficit was found for all the patients by a standard clinical examination. TSC-associated epilepsy generally onsets after birth, and is often refractory to antiepileptics, surgical management of intractable epilepsy with TSC is usually restricted to the patients having epileptogenic foci associated with tuber located in non-eloquent areas of the cortex [8-14]. These results are generally very satisfactory after complete resection of the epileptogenic tuber . Tailored surgical resection of epileptogenic foci has been reported to stop seizures in 57% of drug-resistant patients and decreased seizures frequency more than 90% . But resection to an epileptogenic tuber overlapped by functionally cortical cortices might be unacceptable because of high risk of neurological deficits. It is commonly recommended that patients with multiple and bilateral epileptogenic foci are not amenable to resection surgery, especially involving the eloquent cortex . With the consideration of MST interrupting horizontal synchronizing neuronal networks while preserving vertical functional units, and MST was firstly introduced to treat epilepsy originating from functional cortex by Morrell . Placement of pure MST over the sensorimotor cortex has been shown to produce a clean electrocorticogram with longlasting seizure remission . There is almost no literature to report the treatment of TSC-associated epilepsy involving eloquent cortex with MST. Only Romanelli P reported that one patient who was TSCassociated epilepsy associated with multifocal epileptogenic foci involving eloquent cortex achieved a favorable outcome after underwent combination of MST and resective surgery . The other reports on the efficacy of pure MST or resection with MST are different widely. Jeffrey P. Blount reported that 12 (46%) patients were seizure free (Engel Class I), 11 (42%) patients achieved Engel Class II and III in 26 patients who underwent cortical resection with MST . Susan S. Spencer reported that of 12 subjects who underwent pure MST or resection and MST, five (42%) patients obtained a significant improvement in seizure frequency and two patients had a marked decrease in the severity of their seizures . Orrin Devinsky also reported that 10 (77%) patients of 13 were improved by MST and resection . BCFC is a new surgical technique that can reduce the cortex-related seizures as a result of destructing the epileptic foci and transmission by thermal energy, which is applied with bipolar coagulation forceps. The mechanism underlying BCFC in treating epilepsy is presumed to have a similar principle as MST. Our previously clinical trials have demonstrated that the electrocoagulation with output power on 4-5W can damage the external molecular layer, external granular layer, and the external pyramidal layer (only reaches to the third layer of the cortex), without decaying the internal pyramidal layer (Figure 4). The surgical procedure is safe without leading to unacceptable neurological deficits [4-7]. The pure BCFC technique has showed good efficacy to treat refractory epilepsy as the epileptogenic foci is located in the eloquent . When epileptogenic focus overlaps the eloquent cortex, the approach of combination of resection and BCFC can safely produce ablation of the epileptogenic focus [4-6]. Our previous study also showed that lesionectomy combined with BCFC (71 patients) was significantly more effective than lesionectomy only (78 patients) with the 2-5 years of follow-up [5,6]. Figure 4: Epileptogenci regions located in the eloquent and non-eloquent areas. After BCFC, the molecular layer of the cerebral cortex and the superficial external granular layer were coagulated and denatured, and the granular layer and the outer vertebral body of the brain tissue were edematous. HE x 40. In general, compared with lesionectomy with MST, the outcome and complications of BCFC with lesionectomy are similar. On the one hand, BCFC was applied over the arachnoid membrane; On the other hand, BCFC causes thermal injury, while MST leads to mechanical injury. Therefore, the complications of BCFC are less severe. iv. The approach of combination of resection and BCFC can safely produce ablation of the epileptogenic focus when ictal onset overlaps the eloquent cortex [4,5]. v. Compared with MST, the complications of BCFC seem less severe. Although the BCFC technique is only a palliative surgery and cannot be applied for all epilepsies , and long-term follow-up studies of international multicenter are required to delineate further effects, the combination therapy of foci resection and BCFC to manage the TSC-related epilepsy involving eloquent cortex holds significant promise for future therapy. The approach of foci resection with BCFC is a new and effective method and can meaningfully manage the TSC-associated refractory epilepsy involving eloquent areas without permanent neurological deficit. Prospective randomized studies are needed. The work is supported by Beijing Municipal Science & Technology Commission (Z161100000516131), The Capital Health Research and Development of Special (2016-1-8012) and Basic Clinical Research Cooperation Project of Capital Medical University (15JL90) in China. We confirm that we have read the Journal’s position on issues involved in ethical publication and affirm that this report is consistent with those guidelines. Curatolo P, Bombardieri R, Jozwiak S. Tuberous sclerosis. Lancet 372(9639), 657-668 (2008). Devinsky O, Romanelli P, Orbach D, et al. Surgical treatment of multifocal epilepsy involving eloquent cortex. Epilepsia 44(5), 718-723 (2003). Romanelli P, Najjar S, Weiner HL, et al. Epilepsy surgery in tuberous sclerosis: multistage procedures with bilateral or multilobar foci. J. Child. Neurol 17(9), 689-692 (2002). Luan G, Sun Z, Bai Q, et al. Surgical treatment of intractable epilepsy combined with bipolar electrocoagulation on functional cortex. Stereotact. Funct. Neurosurg 77(1-4), 233-238 (2001). Yang Z, Luan G. Treatment of symptomatic epilepsy with lesionectomies combined with bipolar coagulation of the surrounding cortex. Chin. Med. J (Engl) 116(12), 1930-1932 (2003). Feng Zhai, Jian Zhou, Tianfu Li, et al. The outcome of bipolar electro-coagulation with lesionectomy in the treatment of epilepsy involving eloquent areas. Stereotact. Funct. Neurosurg 93(1), 1-9 (2015). Cui Z, Luan G, Zhou J. Pure bipolar electro-coagulation on functional cortex in the treatment of epilepsy involving eloquent areas. Epilepsy. Res 99(1-2), 139-146 (2012). Avellino AM, Berger MS, Rostomily RC, et al. Surgical management and seizure outcome in patients with tuberous sclerosis. J. Neurosurg 87(3), 391-396 (1997). Baumgartner JE, Wheless JW, Kulkarni S, et al. On the surgical treatment of refractory epilepsy in tuberous sclerosis complex. Pediatr. Neurosurg 27(6), 311-318 (1997). Bebin EM, Kelly PJ, Gomez MR. Surgical treatment for epilepsy in cerebral tuberous sclerosis. Epilepsia 34(4), 651-657 (1993). Bye AM, Matheson JM, Tobias VH, et al. Selective epilepsy surgery in tuberous sclerosis. Aust. Paediatr. J 25(4), 243-245 (1989). Guerreiro MM, Andermann F, Andermann E, et al. Surgical treatment of epilepsy in tuberous sclerosis: strategies and results in 18 patients. Neurology 51(5), 1263-1269 (1998). Koh S, Jayakar P, Dunoyer C, et al. Epilepsy surgery in children with tuberous sclerosis complex: presurgical evaluation and outcome. Epilepsia 41(9), 1206-1213 (2000). Andermann F, Andermann E, Palmini A, et al. Bilateral porencephalic defect and bilateral perisylvian polymicrogyria. Brain. Dev 13(6), 464 (1991). Jansen FE, van Huffelen AC, Algra A, et al. Epilepsy surgery in tuberous sclerosis: a systematic review. Epilepsia 48(8), 1477-1484 (2007). Curatolo P, Jozwiak S, Nabbout R. Management of epilepsy associated with tuberous sclerosis complex (TSC): clinical recommendations. Eur. J. Paediatr. Neurol 16(6), 582-586 (2012). Morrell F, Whisler WW, Bleck TP. Multiple subpial transection: a new approach to the surgical treatment of focal epilepsy. J. Neurosurg 70(2), 231-239 (1989). Wyler AR, Wilkus RJ, Rostad SW, et al. Multiple subpial transections for partial seizures in sensorimotor cortex. Neurosurgery 37(6), 1122-1128 (1995). Blount JP, Langburt W, Otsubo H, et al. Multiple subpial transections in the treatment of pediatric epilepsy. J. Neurosurg 100(2 Suppl), 118-124 (2004). Mulligan LP, Spencer DD, Spencer SS. Multiple subpial transection: The Yale Experience. Epilepsia 42(2), 226-229 (2001).